Rooted in concept and emotion, my artwork today is intuitively accomplished and always evolving. Working in series allows me to experiment with different materials and develop new techniques. I love the unpredictability of abstract painting and the physical demands of working large. I build the canvases myself, and they are often bigger than me. My monochromatic series explore the coexistence of light and dark, both literally and metaphorically, while my other abstract work is often in close conversation with nature and influenced by my surroundings. I started painting when I was nine years old. I believe all art is autobiographical, whether intentional or not. My small abstract paintings on mirror document fragments of my life, such as visiting Cuba, or personal moments recorded in a saved voicemail message. My recent “Remnant Series” is made of dried acrylic paint scraped from my palette, saved for over a decade, and cast in epoxy resin. This series was done many years after the death of a close friend and is about healing & the compression of time. 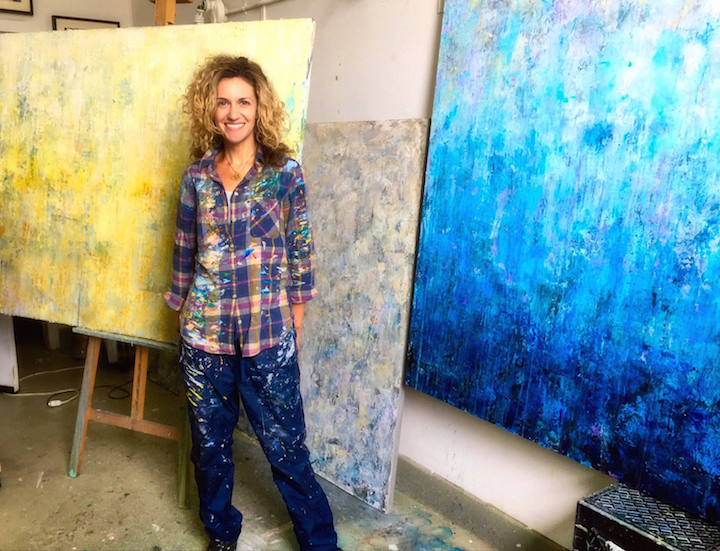 Whether I am creating large scale works or experimenting with new mediums, I enjoy both the challenge and satisfaction of painting and making art.